Great news! Our fascinating new seminar series entitled ‘Discovering the Landscape’ kicks off on Tuesday 10 February with an overview of the collections (‘From garden space to masterplan: The Landscape Institute collections at MERL’) with our archivist Caroline Gould and landscape architect Annabel Downs. In 2013, MERL received the archives and library of the Landscape Institute. Our Spring 2015 seminar series focuses on these collections as well as the figures and themes which have shaped the English landscape over the past 200 years. 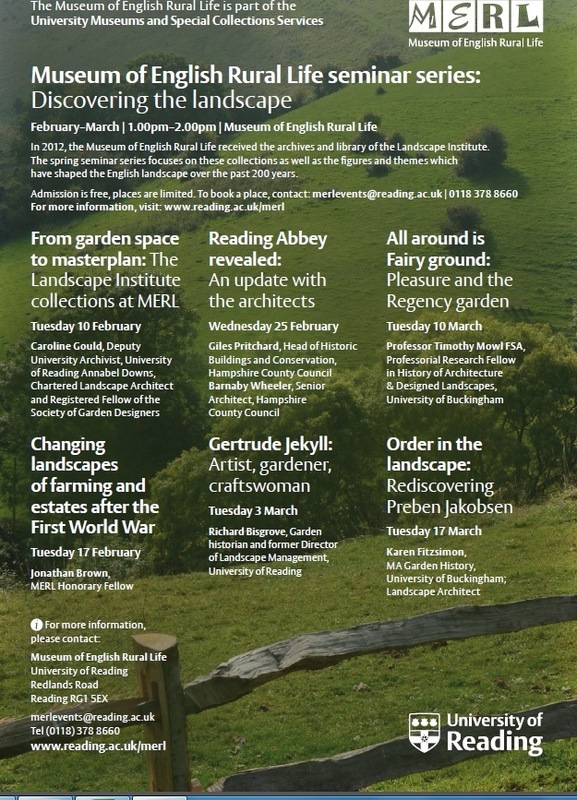 Please see the seminar web pages here for further details on the ‘MERL Seminars: Discovering the Landscape’ series. This entry was posted in Collections, Discovering the landscape, Events, Uncategorized. Bookmark the permalink.